This article is about Balrog the boxer, also known as "M. Bison" in Japan. For the character known as "Balrog" in Japan, see Vega (Street Fighter). For the character known as "M. Bison" outside Japan, see M. Bison. Balrog, is a fictional character in Capcom's Street Fighter series. He made his first appearance in Street Fighter II: The World Warrior in 1991. In the series, he is a disgraced boxer that works for M. Bison's Shadaloo organization. Balrog is depicted as an African-American boxer wearing blue trunks with white trim and a torn white shirt under a blue tank top, wearing red boxing gloves and boxing shoes. In Japan, the character of Balrog is named M. Bison (with the letter being an initial for "Mike") after real-life boxer Mike Tyson. However, when the developers of Street Fighter II were working on the overseas versions, they rotated the names of three of the boss characters for the English localization, fearing that naming the boxer character "Mike Bison" might be a legal liability.". At 1.93 m (6 ft 4 in), Balrog was one of the tallest fighters in Street Fighter beside Zangief, Sagat, Hugo, and Thunder Hawk. As a comparison, Tyson is 1.80 m (5 ft 11 in) tall. In his Alpha 3 intro, Balrog's weight is listed as 102 kilograms (225 lb), the same as Tyson in his last victory. A character named Mike, who was also an African-American boxer, appears in the original Street Fighter. 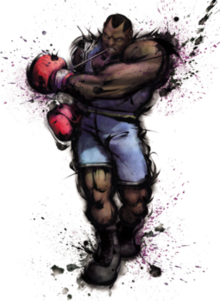 Although recognized as a separate character, Mike is considered to be a prototype of Balrog due to their similar names (when one considers Balrog's Japanese name of Mike Bison) and gameplay. Balrog appears in Street Fighter II as the first of four CPU-controlled opponents at the end of the single-player tournament. Balrog would become a playable character in subsequent revisions of the game, beginning with Street Fighter II: Champion Edition. Balrog is characterized as a belligerent ghetto-raised boxer seeking the "American Dream" and one of the "Four Devas" (Shitennou "Four Heavenly Kings") of Shadaloo. His next major appearance was in Street Fighter Alpha 3. Balrog was a CPU-controlled sub-boss in the arcade version who faced only certain characters and was only playable after certain requirements were met, but also selectable as a playable character via secret code. He was made into a regular playable character in the arcade update and subsequent home versions and given his own in-game plot, home stage and endings. This incarnation of Balrog also appears in Capcom vs. SNK and Capcom vs. SNK 2. Balrog also appears in SNK vs. Capcom: SVC Chaos. Balrog appears in Street Fighter IV and Super Street Fighter IV, once more serving Shadaloo in the hopes of making easy money. He appears in the crossover fighting game, Street Fighter X Tekken, with his official tag partner, Vega. Balrog reappears in Street Fighter V as one of the game's six DLC characters, released in July 2016. As a boxer, Balrog generally does not fight with his feet. This makes him unique among the game's characters. Instead of possessing three punch attacks and three kick attacks like the rest of the cast, he has six punches, with the kick buttons generally (but not always) used for low blows while the punch buttons are used for high blows. He also has no projectile attacks, unlike many Street Fighter characters. Many of his special attacks, super combos and ultra combos consist of dash punches, some of which can pass through projectiles. In the 1994 anime film Street Fighter II: The Animated Movie, Balrog is portrayed as one of Bison's three top men like in the Street Fighter II games, serving as a representative and informant for Bison during a drug deal in Las Vegas and ends up fighting against E. Honda during the final battle. Honda defeats him off-screen and later carries him to safety. He is presumably handed over to the authorities after Bison is defeated by Ryu and Ken. In battle, he wears dark green cargo pants instead of his boxing trunks, and lacks his boxing gloves. He is voiced by Jouji Nakata in the original Japanese version and Joe Romersa in the English dub. In the 1994 live-action film version of Street Fighter, Balrog is portrayed by Grand L. Bush and is a supporting protagonist, more specifically the videographer in Chun-Li's news crew. Like the other members (Chun-Li and Honda), Balrog holds a grudge against the Shadaloo Tong, headed by Sagat, for ruining his boxing career, after apparently refusing to throw a match for them. Near the end of the film, he dons a purple variation of his regular outfit from the games and aids Guile, Chun-Li, Ryu and Ken in rescuing the hostages, and personally breaks the lock to the hostage chamber to free them. In the AN forces' files, he is listed as "Balrog, G", but what the "G" stands for is not revealed. He also appears in the arcade and home versions of the Street Fighter: The Movie game. The 1995 anime series Street Fighter II V features a significantly altered depiction of Balrog where he is a Shadaloo spy who has infiltrated Interpol. Balrog hires Cammy to assassinate Chun-Li's father Dourai, under the false pretense that Dourai is the Shadaloo spy. Unlike in the games, Balrog never actually fights in the TV series and only appears in wearing boxing gear in concept art and during the show's second opening animation. He was voiced by Tomomichi Nishimura in Japanese, while Joe Romersa reprises his role for the English dub. In the 1995 Street Fighter animated series, Balrog appears as a computer programmer working for Bison. He appears in one episode only ("Medium is the Message"), where he was voiced by Paul Dobson. In the 2009 Street Fighter: The Legend of Chun-Li, Balrog is played by Michael Clarke Duncan. He serves as Bison's bodyguard, but is not depicted as a boxer. He is killed by Chun Li's mentor Gen.
Balrog was voted 18th in Capcom's own popularity poll of 85 characters for the 15th anniversary of Street Fighter. IGN ranked Balrog at number 15 in their list of top Street Fighter characters in 2008, noting his similarities to Tyson as well as his role as one of boxing's representatives in fighting games. In 2009, GameDaily named him one of gaming's greatest black characters, noting that while not the deepest character on the list, he had significant longevity as a Street Fighter series character and received praise for representing boxing in the game "alongside flashier martial arts". UGO ranked him as 12th on a list of top Street Fighter characters in 2010. GamesRadar wrote in a list of gaming’s most satisfying uppercuts, "while it’s hardly Street Fighter’s most iconic or famous uppercut, the Dash Upper still packs a pretty nasty wallop." Bleacher Report listed Balrog as the 10th best fictional boxers, but criticized him by calling him "one of the worst video game bosses ever", citing that he could only punch. On the other hand, Edge stated however Balrog "seems a little useless" in light of Dudley, a boxer introduced in Street Fighter III. In the official survey by Namco, Balrog was the fourth-least requested Street Fighter side character to be added to the roster of Tekken X Street Fighter. Studio Bent Stuff (September 2000). All About Capcom Head-to-Head Fighting Game 1987-2000. A.A. Game History Series (Vol. 1) (in Japanese). Dempa Publications, Inc. ISBN 4-88554-676-1. ^ "Street Fighter IV character profiles, Street Fighter IV Xbox 360 Features". GamesRadar. 2009-01-14. Retrieved 2011-11-05. ^ Ryan Clements. "Street Fighter IV: Balrog - PlayStation 3 Preview at IGN". Ps3.ign.com. Retrieved 2011-11-05. ^ "キャラクターランキング". Web.archive.org. 2005-12-19. Archived from the original on December 19, 2005. Retrieved 2011-11-05. ^ Furfari, Paul (2010-08-25). "Top 50 Street Fighter Characters". UGO.com. Archived from the original on December 25, 2013. Retrieved 2014-06-21. ^ "Page 2 of Gaming's most satisfying uppercuts, Street Fighter x Tekken Xbox 360 Features". GamesRadar. 2010-09-28. Retrieved 2011-11-05. ^ "The 10 Greatest Fictional Boxers of All Time". Bleacher Report. 2009-02-17. Retrieved 2011-11-05. ^ Staff (2008-01-09). "Street Fighter IV Unwrapped". Edge. Retrieved 2009-08-15.